This product sheet is originally written in English. Please find below an automatic translation into French. If you have questions please contact us. Add the shop to selections. Audi a4, a6, vw passat complete set of front suspension arm kit triangle track control ball joints 20 mm. 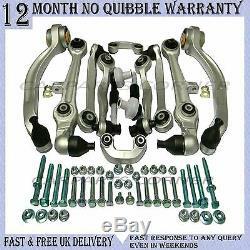 (13 months without quibble guarantee, it is warranty only, no work replacement cost included). (Please contact us through debay message with registration number and engine code). Oe reference / oem number. 8d 0498998 / 8d 0 498 998. (please match the part number to avoid bad purchase). Not sure, the part number !! Includes: 2 x Upper Front Arm Front Suspension 2 x Upper Front Rear Suspension Arm 2 x Front Front Suspension Lower Arms (20mm Ball Joint) 2 x Lower Front Suspension Rear Arm 2 x Track Ball Joint 2 xc Shaped Anti Roll Drop Links 18 x bolts 22 x connection axle nuts: front (left and right). Since it is not a DIY product, we strongly suggest using a professional service for installation. We are not responsible for any issue of damage or machine performance due to improper installation and disassembly. Really defective part will be replaced as soon as possible, but we must be informed upon receipt of the defective part. Same day shipping if ordered before 4pm except on weekends or holidays. Express delivery service at competitive price. If your preferred delivery option is not listed, please contact us, we will do our best. Our collection service is open even at the end of the week. Model dalfa romeo / series. Model dalfa romeo / series 2. Renault model / series 2. Renault model / series 3. Renault model / series 4. Renault model / series 5. Volvo & Toyota model / series. Rover & suzuki model / series. Model of jeep / series. Saab & renault model / series. Opel model / series 1. Opel model / series 2. Vauxhall model / series 1. Model / series jaguar & daimler. Model / series mg & pininfarina. Audi & vw model / series. Model / series citroen & daimler. Fiat & rover model / series. Model of lancia / serieslancia model / series. Order from us and we will ensure the perfect delivery for you! Same day shipping if ordered before 16:00 or. Competitive prices for express delivery. If a preferred delivery option does not appear on the item you need, please contact us so we'll see what we can do. With our 100% feedback you can trust us to deliver! All items come with a one year warranty and must be returned in exchange for a replacement or refund. Please make sure that you order the correct item referring to the photo. All items purchased will be exactly the same as the item shown on the photo. There will be 20% restocking for free if you buy the wrong item so better to contact us first! Please note that we are not responsible for any additional costs or work incurred due to a defective product. We offer a 1 year without quibbling guarantee so you can order from us with confidence. If you are not satisfied with your order, please contact us again if we can help solve your problem. We are committed to providing superior customer service wherever possible and always want to provide the best customer experience for you. Great quality at the right price for you! We get quality parts oem specification from some of the leading suppliers in the industry. Online courses can sell to you at prices without sacrificing quality! We are proud of our impeccable customer service because our feedback reflects. Please do not hesitate to contact us in any of the following ways for any information and your entire question will be answered as soon as possible. Collection from our warehouse is also possible. All you need to do is contact and we will arrange the date and time suited to your best. Collection times are as follows. Collection of southall (ub2), middlesex. All you need to do is click on 'Buy it now' on the item you wish to buy. Corner autoparts are committed to ensuring all our customers are fully satisfied and can trust the order from us. Always anxious to ensure that our customers are satisfied with their order with our 100% 5 star feedback. 8d0498998 / 8d0 498,998 / 8d0 498,998 s1. The item "audi a6 4b, c5 1997-2005 break set front suspension control kit" is on sale since Monday, January 22, 2018.